One of Only 160 Periscopica Models Constructed; Gandini's Purest and Most Striking Design. Matching Numbers, Comprehensively Restored, and Originally Delivered in Metallic Blue with Two-Tone Interior. In the pantheon of great sports car design, history is lined with achievements worthy of praise. 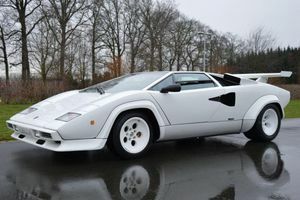 But the Lamborghini Countach still remains the shocking hammer of audacity that nailed a gasping exclamation point on the sports car world, ultimately changing everything about performance, and beauty even decades after its launch. 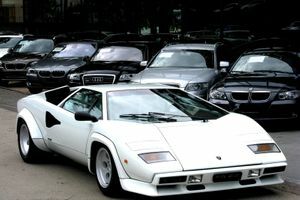 The Countach forced everyone to recognize that a tiny fledgling company barely a decade old was showing the world that it was time for new leadership. Unveiled at the 1971 Geneva Motor Show, no one in attendance was prepared for the shock of the Gandini-penned V12 powered Countach; it simply changed everything about sports car design. 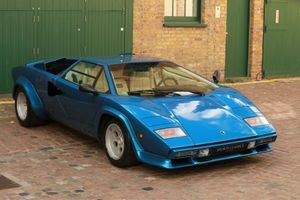 Unlike many one-off show cars, Lamborghini surprised everyone once again by immediately preparing the car for production. The daring cab-forward architecture, longitudinal V12 engine, and the aggressive geometric design captivated everyone with visions of the future. After three long years refining the design to make it achievable for production without compromising the Gandini design, Carrozzeria Bertone revealed the first production cars. 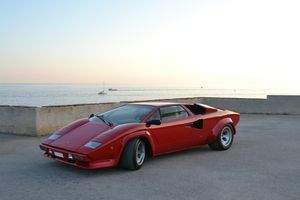 The Countach not only became an instant performance legend, it immediately became the object of desire, celebrated in posters, advertisements, movies, and exotic car showrooms throughout the world. 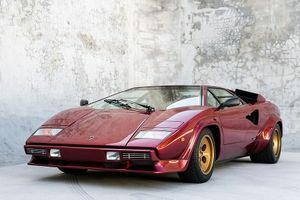 Arguably the father of modern supercars today, Lamborghini continues to shock the public with their radical performance offerings, but none today have so indelibly made their mark on dreamers and enthusiasts than the Countach. 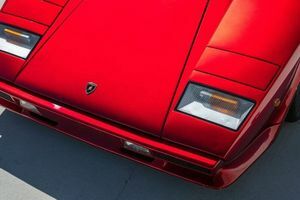 In production for approximately fifteen years, the pure shape of the early LP400 Countach—void of later mandated import modifications, various aerodynamic trim, and with the properly proportioned low profile—is a masterwork of industrial design. These earliest production versions offered unobstructed clarity of the original Gandini concept contained in a drivable exotic. Among the many celebrated and innovative details exclusively featured on early cars is the Periscopica roof configuration. This innovative feature was derived from the low profile of the rear window in relation to the roofline and driver position. A traditional rear view mirror would simply not allow a clear view of the rear of the car. In response to this problem, the roof was recessed allowing a periscopic view of the rear through a cleverly dropped roof section in between driver and passenger. Only 160 cars were built with this unique and desirable feature. In recent years, astute collectors have sought out early examples in part due to the visual impression of the original “Periscopica” design, clean uncompromised details, and the sculptural ferocity so dramatically represented in the original masterpiece. 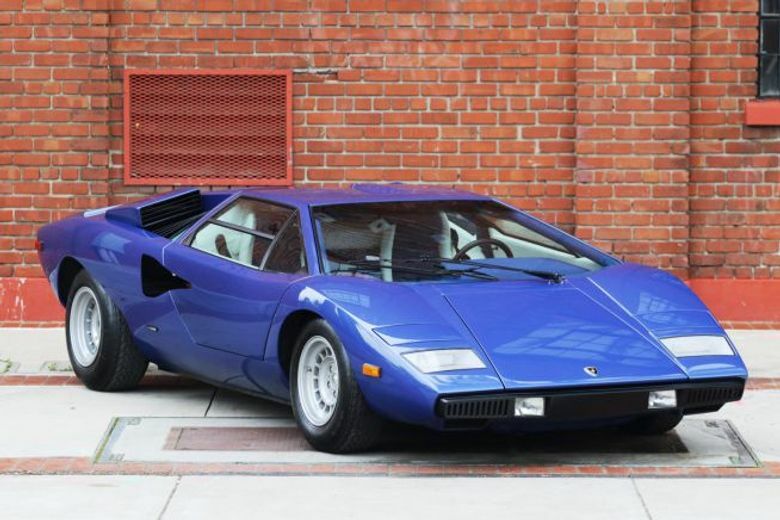 This particular matching numbers Countach is number 77 of the very first 160 original Periscopica cars. Originally registered in Canada when new, it was delivered to Canadian importer Eugene Carrie of Ontario in October 1975. Painted Blu Tahiti with the interior trimmed in Bianco and Blu, the car was further optioned with a Philips cassette player and factory air-conditioning. 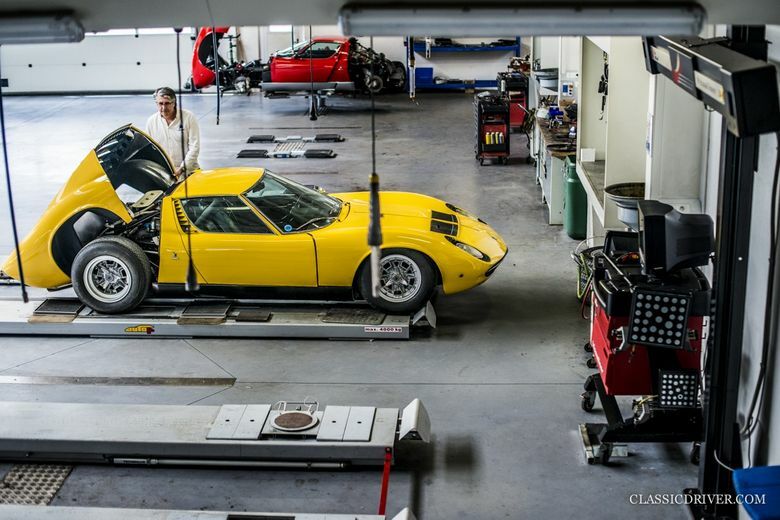 By 1978 the car had arrived in the US eventually becoming the subject of a comprehensive restoration at the hands of Lamborghini expert Peter Cohen, proprietor of the Florida based Lamborghini-authorized dealership, Ultimate Motor Works. 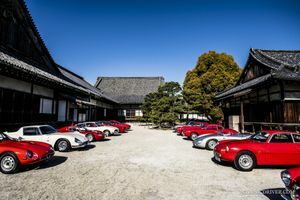 During the extensive two-year restoration everything from the air-conditioning, suspension, engine, interior, and of course all the remarkable early series details was examined and restored with careful attention to retain factory correct specifications. 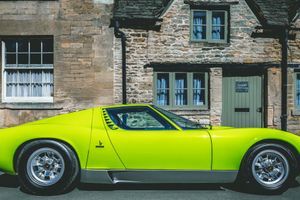 During the restoration, the esteemed and highly regarded Valentino Balboni, a 40 year veteran Lamborghini employee and test driver for their cars, visited the car on two occasions. Having previously resided in some of the most significant collections, this stunning car today shows just 15,875 kilometers. 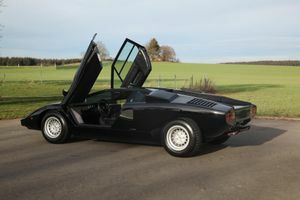 This comprehensively restored Countach LP 400 Persicopica presents as a stunning example of brilliant design and engineering. The early body design is clean and pure especially as the crisp lines and geometric forms show so well in this color. Carello driving lights and thin vertical vent slots, almost identical to the original Gandini concept, accent the razor thin front bumper. This gorgeous feature is even more remarkable especially when viewing the later year heavy bumper cars. It is astonishing to note that in profile, the front bumper line is positioned well below the front wheel axle center. The vivid blue paint is very glossy throughout showing only very minor evidence of aging since restoration. Overall the quality of the finish is excellent, supported by properly finished black louvered trim, clean and unmarked glass, and excellent emblems. The low clear plastic front indicator light covers and rear taillight surrounds are properly polished to a high gloss. The recessed red quad-pipe ANSA exhaust tips put a striking finish on the rear of the car. The unmistakable, innovative scissor doors open and close smoothly via a cleverly concealed pushbutton knob hidden inside the twin NACA duct side intakes. Both doors smoothly swing open and shut with confidence. The hood and trunk both open and shut properly and show excellent panel gaps, likely better than original factory specifications. The rear of the car is breathtaking. The expansive rear deck flows outward into the dramatically angled windshield, arrayed by vents and triangular forms, punctuated by the recessed V shaped channel for the periscope rear view mirror. The beautifully finished Campagnolo factory wheels are in excellent condition, shod with correctly sized Michelin XWX tires with ample tread remaining. The aggressive stance, pure body form, angular geometry, and vivid color deliver a remarkable impression. The overall exterior presentation is both vivid and energetic, supported by excellent detailing and attention to originality wherever possible. The interior is a dramatic visual delight in every way. The two-tone color combination was the pinnacle of 1970s fashion and perfectly suited for the daring look of this Countach. The sloped two-tone seats are a brilliant combination of blue fabric and white leather, applied with careful stitching used on the dashboard, center console and door panels. The materials all present with very good fit and finish, showing only minor areas of use since the restoration was completed. The dashboard and center console are surrounded by blue fabric and stitched white leather breaking up portions of the center console and brushed aluminum dash face with dark instruments. These materials create a very purposeful appearance to the jet-fighter inspired cockpit. The SW instruments are in excellent condition with solid numbers and dark dial faces, with an array of colored indicator lights, appearing more like F-16 avionics than automotive lighting. The correctly carpeted trunk houses a complete factory tool kit and jack with two round accessory canisters stored inside a proper round zippered case. The front storage compartment shows proper factory detailing including a narrow profile factory spare rim and tire nesting below the dramatically low hood line. Under the vented rear engine deck, the matching numbers V12 engine and engine compartment have been very well prepared during the restoration and maintained accordingly since. Although some time has passed and a few painted areas are showing very minor aging, the engine compartment and engine components present very nicely. Twin factory air cleaners feeding the amazing quad cam V12 engine tightly flank six side-draft Weber carburetors. 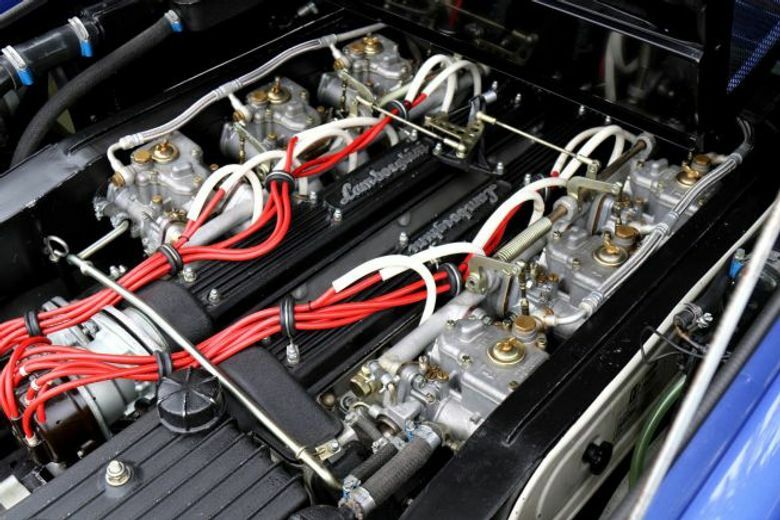 Correct hoses, hardware, and proper fasteners trim the engine compartment, in keeping with methods used at the Lamborghini factory. The engine block retains the correct factory number stamping, which matches the VIN plate mounted to the engine compartment. The remaining factory data plates and various engine compartment decals are in place. The underside of the car is clean and dry, showing correct components all of which indicate the car has been properly restored, stored, and maintained since. A quick click of the ignition and the car erupts into a rapturous roar, settling into a deep idle. The exhaust note sends ripples down your spine, even as a spectator. Once inside and the door is latched, the outward view is expansive and engaging. The large swept dash, having been covered by soft light-absorbing material reduces reflections and aids frontal visibility. Once warmed up and underway, the instruments show excellent oil pressure and correct running temperatures. The clutch and gearbox operate as expected, delivering smooth shifts in each gear, with amazing power on tap. Acceleration, while certainly quick, is all the more exhilarating as your seating position is so low, even city speeds seem faster. Once on the open road, a foot on the throttle delivers a swift response as the Countach leaps to highways speeds in a matter of seconds. The car drives very confidently showing no external smoke or seeping cabin fumes. The air-conditioning functions properly, and while the Philips radio also works, most drivers will be more inclined to listen to the music made by the symphonic V12 engine. This Countach comes with a complete set of tools and tool case, as well as select documents supporting the US importation of this rare Countach.